S&P 500 Index is quickly back up to the Green Line. 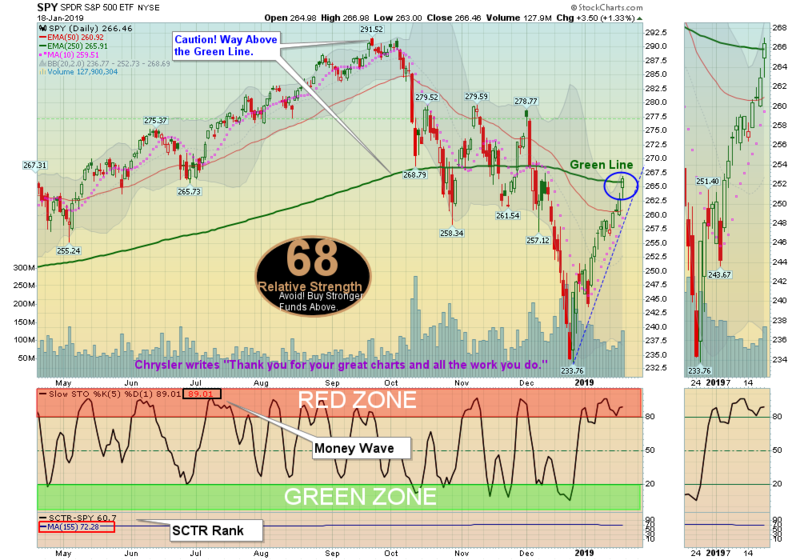 01/20/2019: Markets were up again this week as the Indices quickly rallied back up to their Green Lines (250-day avgs.) The Green Line is more of a “Fair” value of an Investment (Way Above the Green Line is puffed up by GREED, & Way Below the Green Line is Over-Sold from FEAR). Investor Sentiment has turned much more positive according to the FEAR Index. Maybe some profit taking soon. For the week the Dow was up 2.96%, the S&P 500 was up 2.89%, and the Nasdaq 100 was up 2.78%. The very Long Term Trend on the Stock Markets is UP. The Inflation Index (CRB) was up 2.32% but is Below the Green Line, indicating Economic Weakness. Bonds were down 0.84% for the week and are Above the Green Line, indicating Economic Weakness. The US DOLLAR was up 0.79%, after becoming Over-Sold on the weekly chart. Crude Oil was up 4.75% for the week at $54.04, and GOLD was down 0.54% at $1283. QUESTION: Colin writes “I have followed the recommendations on the buy signals and had the recommended stop losses in. I have stopped out off all positions except one. Ok that’s fine. But in your portfolio the position is still open. How can that be? I am confused as I may have done something wrong. Please help me to get that right. ANSWER: Sorry for the confusion Colin… The Investment must CLOSE below the Support or Stop Price, to avoid whipsaws by the sleazy market makers. Before the Close we send out the Money Wave Alert emails if there are any Changes to the Stops. Please check the “SELLS TODAY” section of each email where we warn of positions being Stopped Out on the Close. Also, the PORTFOLIO PAGE is kept current before the Close with current Stops (on the Close only).